When the Asus G72Gx power cord is plugged into the laptop, the green LED light on the power cord goes out – not a good sign. And he smelled something electrical burning coming from the laptop – not a good sign either. And yes power cord LED light went out here when checked, and yes there was still a burn smell coming from the rear exhaust on the Asus G72Gx laptop. Well a possible “power surge” and a definite electrical burn smell coming from back of the Asus G72Gx laptop is not a good sign at all. Decided to take apart just to see. 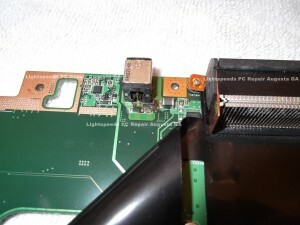 Below photos are what I found and suspected a D.O.A, dead on arrival motherboard was confirmed. End result, motherboard needs replaced by Asus. Do you notice something in the above photo? Motherboard is burned & melted. 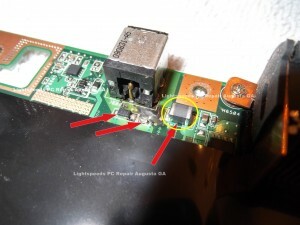 Plugged power cord into laptop on table, this yellow circled chip began arcing a very small pulsating spark across the motherboard. Strong electrical burn odor began immediately. Pulled the power cord from the wall outlet. Power cord’s LED light was still out. I believe the board was heating up, melting, burning from inside the PCB of the motherboard itself. “D.O.A.” – dead on arrival as suspected. Internal circuits are shorted out and burned, un-repairable damage. $1300+ nice gaming laptop now turned into a paperweight. 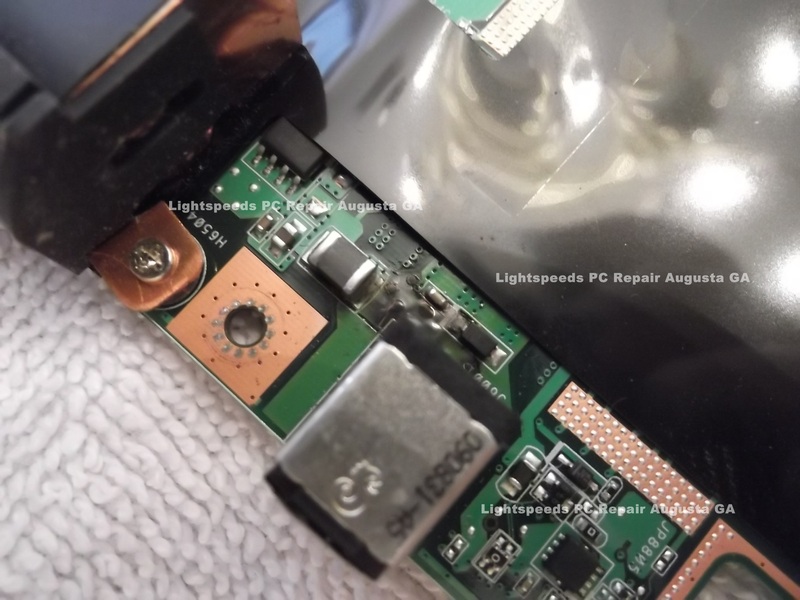 This is what can happen when the dc power jack inside of the laptop has a short or loose connection. 4 photos above, you can see I have a new dc jack ready to solder & install, not needed now, for a new dc jack on this laptop now will not help it now. Customer did say he “believed there was a power surge after he arrived home”, not really sure. 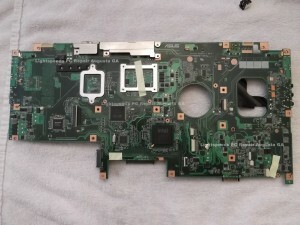 But this Asus G72 motherboard is done – defective. Power cord was new, customer stated he purchased just 3 weeks ago, a brand named Asus power cord. Faulty power cord,, possibly. I asked customer if anyone else recently worked on or repaired the dc jack. He stated “no” has never been open since he purchased the laptop new. On both sides of the motherboard around the dc jack area there was a very noticable excess of solder “flux” especially on the non burned side of board around the dc jack. Solder flux is great for de-soldering & soldering, but everyone that does soldering knows to clean any excess solder flux off the circuit board real good. I use 90% rubbing alcohol and an old toothbrush to clean both sides of the dc jack after a dc jack replacement. Leaving excess solder on the circuit board can be corrosive, damage the board within time, especially acid based flux. Asus was a bit sloppy here on leaving this heavy flux around this area. This was not dried up old solder flux, it was still sticky probably from the heat of the burn. Very surprised and shocked to see this solder flux left by Asus on there motherboard, it is sloppy workmanship for one, AND might of caused this short, burned out motherboard on this G72Gx laptop. So I’m guessing at the power surge, laptop was left plugged in, with no surge protector that cause the power short, burn on the motherboard. Year and a half old expensive laptop out of any type of warranty. This laptop just might of burned the house down if gone for a period of time. There could very well be some type of fault in this motherboard. 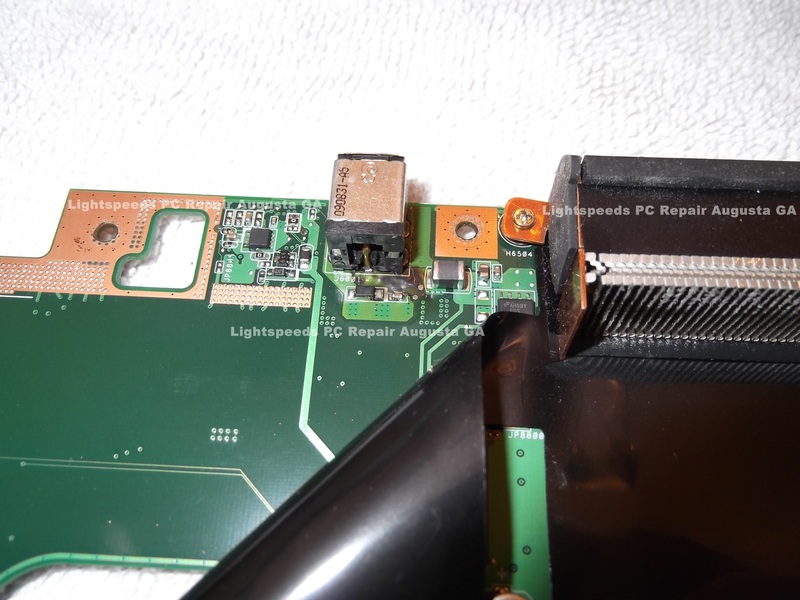 Since this one Asus G72Gx above in this article write up came, there have been 2 other Asus G72Gx models came to me for DC Jack repair. I found the same similar burns on these 2 other Asus G72Gx motherboards. And another call from another computer repair shop that found this article, asking me “how did you repair it”,,, I did not repair, nothing I could do for it. Asus will not sell any of there components to anyone. Asus wanted the owner to send laptop back to them to replace, at a very high out of warranty cost from Asus. “This is my 2nd ASUS laptop, and also the 2nd time it has happened”. Interesting to find out how many more have had this similar problem with this same laptop, and others Asus laptops. Mine only lasted right at 18 months before it did the same thing. I spent $189.00 at best buy for them to tell me that all I have is an expensive looking paperweight. There has to be a problem with the motherboard…….I do know that I will never purchase an asus uproduct again. The machine Needs to be plugged in at all times which I didn’t mind, but I never used it for gaming, mostly home office work. Thought I had a great product.WRONG. Is there anyway we can get this thing fixed for a reasonable amount , or should we just junk it? Damn, only 18 months? Well the one here that I had with the melted burn near the power jack, motherboard is no good now. Board needs replaced, board is only available maybe through Asus at an expensive cost. Laptop motherboards just are not widely available like desktops motherboards. Definitely a fault defect in the power circuits within the board. This one here and since then 3 other calls, seen the same similar burns near the same spot. And many other Asus G72 owners searching keywords leading to this article tells me it’s a problem,, and a huge one. It’s is a well built, well design laptop but the motherboard is at fault from the factory on this one hate to say. And Best Buy – $189 to tell you it’s no good is an outrageous price. I only charged the guy for my time (dis-assembly & reassembly) at $45. That’s the problem with laptops anything internal your looking at 2 hrs, maybe 3 minimum time. Desktop system, 5 seconds taking a side panel off and you have the all hardware right in front of you.